Vacuum insulated steel pint glasses are nothing new. Neither are vacuum insulated steel koozies. But the $25 BrüMate Hopsulator Trio cleverly combines both into a single product for all your drinking needs. After sitting in the Hopsulator atop the ice pack for two hours, the beer was still 47 degrees after pouring. The Hopsulator Trio is taller than most koozies out there, steel or otherwise, meaning it can hold and fully insulate 16-ounce tallboys, in addition to 12-ounce cans. The latter fit by sitting atop an included, removable ice pack that rests at the bottom of the Hopsulator, and keeps your drinks even colder. I kept an unopened beer can in the Hopsulator on top of the ice pack for two hours at room temperature, and measured it at a perfectly drinkable 47 degrees after pouring. But what makes the Hopsulator really unique is its ability act as a pint glass for drinks that don’t come in cans. Just screw in the lid with the slide-close drinking spout, and it’ll keep 16 ounces of your favorite beverage hot or cold for hours, while the outside of the cup will remain pleasant to the touch. I realize that you probably don’t take multiple hours to drink a can of beer (really, I do, you don’t have to tell me in the comments), but you don’t necessarily have to for this to be useful. 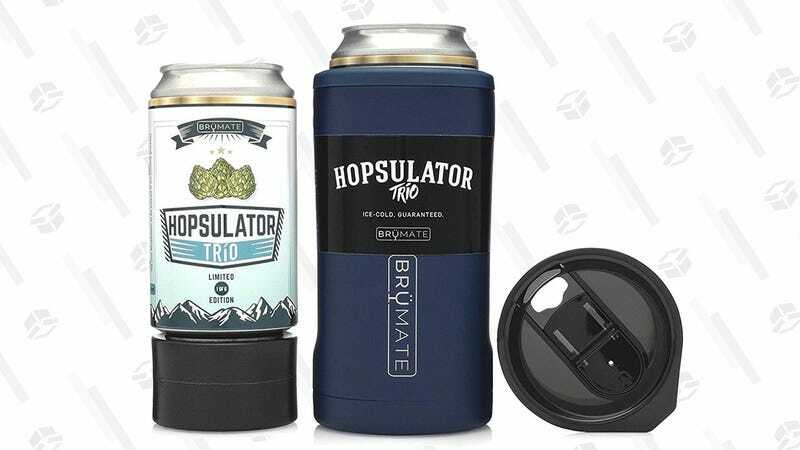 Even if you’re only using the Hopsulator for 30 minutes, your last sip of beer will be nearly as frosty as the first, which definitely wouldn’t be the case if you were using a regular koozie. It’d also make a great travel mug for hot drinks like coffee, which take longer to drink, and get pretty gross if they cool down.